Who could ever forget the amazing rockers like Don’t Let Him Go, Tough Guys and Shakin’ It Loose, plus the solid power ballads like In Your Letter, and of course the super sounds of Keep On Loving You and Take It On The Run. This album was such a smash, some radio stations would even play side one in its entirety due to the amazing number of chart topping songs it contained. 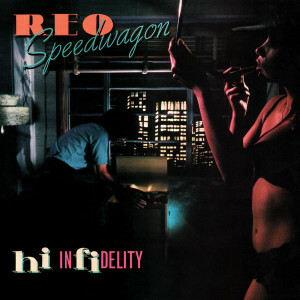 Friday Music once again brings back the definitive classic rock albums with its latest home run Hi Infidelity by REO Speedwagon. Impeccably mastered by Joe Reagoso, we have pressed it on impeccable 180 Gram Audiophile Vinyl at RTI , as well a being featured in a first time gatefold cover!